There are a lot of reasons to watch a standard definition channel instead of a high-definition one. Maybe you’re experiencing rain fade, or maybe the line-of-sight to the high-def satellite has gotten restricted, giving you 771 errors. Maybe you just want the SD feed because you’re watching an older TV and don’t want the bars at top and bottom. You will see a message that it takes a few minutes for this to work. Showing all channels shows both HD and SD channels. 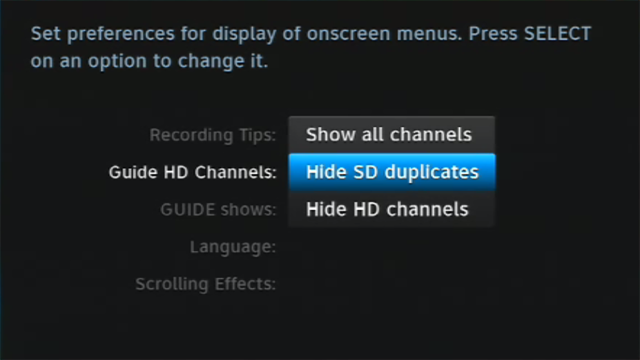 Hide HD duplicates only shows SD channels.